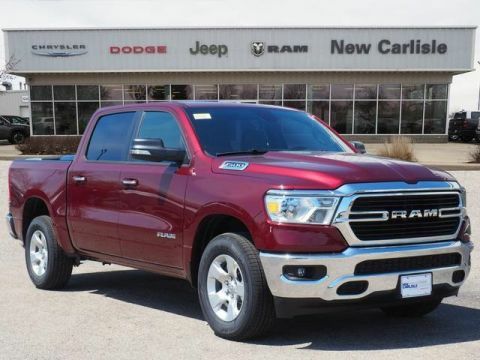 2019 Ram 1500 Big Horn/Lone Star 1500 Big Horn/Lone Star, 4D Crew Cab, 3.6L V6 24V VVT, 8-Speed Automatic, 4WD, Red, Black Cloth, 1-Year SiriusXM Radio Service, 8.4 Touchscreen Display, Apple CarPlay, Auto-Dimming Exterior Driver Mirror, Auto-Dimming Rear-View Mirror, Big Horn IP Badge, Big Horn Level 1 Equipment Group, Class IV Receiver Hitch, Cluster 3.5 TFT Color Display, Exterior Mirrors Courtesy Lamps, Exterior Mirrors w/Supplemental Signals, Foam Bottle Insert (Door Trim Panel), For More Info, Call 800-643-2112, Glove Box Lamp, Google Android Auto, Integrated Center Stack Radio, Power 4-Way Driver Lumbar Adjust, Power 8-Way Driver Seat, Power Adjustable Pedals, Power Heated Fold Away Mirrors, Power-Folding Mirrors, Quick Order Package 23Z Big Horn/Lone Star, Radio: Uconnect 4 w/8.4 Display, Rear Dome w/On/Off Switch Lamp, Rear Power Sliding Window, Rear Window Defroster, Single Disc Remote CD Player, SiriusXM Satellite Radio, Steering Wheel Mounted Audio Controls, Sun Visors w/Illuminated Vanity Mirrors, Universal Garage Door Opener. 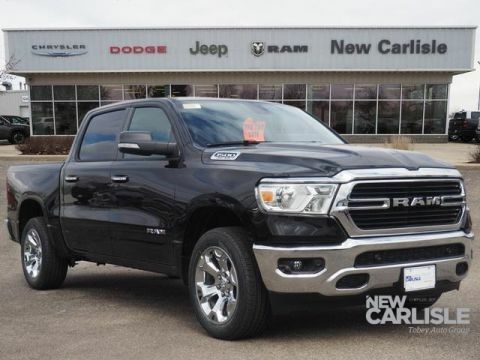 2019 Ram 1500 Big Horn/Lone Star 1500 Big Horn/Lone Star, 4D Crew Cab, 3.6L V6 24V VVT, 8-Speed Automatic, 4WD, Crystal Metallic, Black Cloth, 1-Year SiriusXM Radio Service, 8.4 Touchscreen Display, Apple CarPlay, Auto-Dimming Exterior Driver Mirror, Auto-Dimming Rear-View Mirror, Big Horn IP Badge, Big Horn Level 1 Equipment Group, Class IV Receiver Hitch, Cluster 3.5 TFT Color Display, Exterior Mirrors Courtesy Lamps, Exterior Mirrors w/Supplemental Signals, Foam Bottle Insert (Door Trim Panel), For More Info, Call 800-643-2112, Glove Box Lamp, Google Android Auto, Integrated Center Stack Radio, Power 4-Way Driver Lumbar Adjust, Power 8-Way Driver Seat, Power Adjustable Pedals, Power Heated Fold Away Mirrors, Power-Folding Mirrors, Quick Order Package 23Z Big Horn/Lone Star, Radio: Uconnect 4 w/8.4 Display, Rear Dome w/On/Off Switch Lamp, Rear Power Sliding Window, Rear Window Defroster, Single Disc Remote CD Player, SiriusXM Satellite Radio, Steering Wheel Mounted Audio Controls, Sun Visors w/Illuminated Vanity Mirrors, Universal Garage Door Opener, Wheels: 20 x 9 Aluminum Chrome Clad. 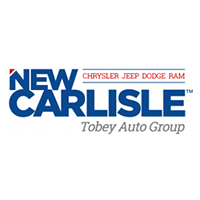 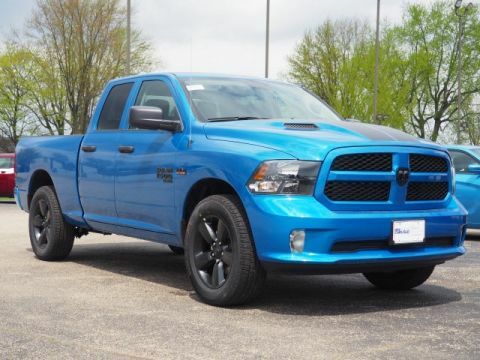 2019 Ram 1500 Classic Express 1500 Classic Express, 4D Quad Cab, HEMI 5.7L V8 Multi Displacement VVT, 8-Speed Automatic, 4WD, Hydro Blue Pearlcoat, Black Cloth, 17 x 7 Aluminum Wheels, 1-Year SiriusXM Radio Service, 4x4 Flat Black Badge, 5.0 Touchscreen Display, Audio Jack Input for Mobile Devices, Black Exterior Truck Badging, Black Headlamp Bezels, Black RAM Head Tailgate Badge, Black Seats, Body Color Front Fascia, Body Color Grille, Body Color Grille w/Black RAM's Head, Body Color Rear Bumper w/Step Pads, Carpet Floor Covering, Cloth 40/20/40 Bench Seat, Delete Class IV Receiver Hitch, Delete Spray In Bedliner, Express Black Accent Package, Express Value Package, For More Info, Call 800-643-2112, Front Floor Mats, Front Fog Lamps, GPS Antenna Input, Hydro Blue Sport Package, Integrated Voice Command w/Bluetooth, Manual Adjust Seats, Media Hub (USB, AUX), MOPAR Sport Performance Hood Decal, No Satellite Coverage w/AK/HI/PR/VI/GU, Overhead Console, Quick Order Package 27J Express, Radio: Uconnect 3 w/5 Display, Ram 1500 Express, Rear Floor Mats, Rear Folding Seat, Rear View Day/Night Mirror, Remote Keyless Entry w/All-Secure, Remote USB Port, SiriusXM Satellite Radio, Sport Performance Hood, Temperature & Compass Gauge. 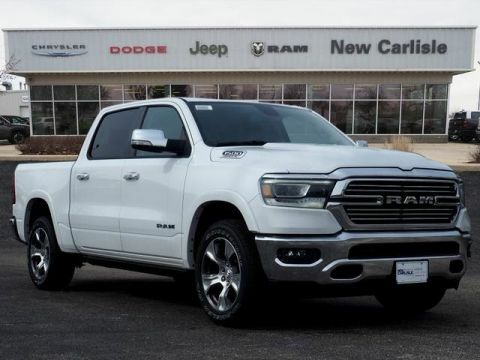 2019 Ram 1500 Big Horn/Lone Star 1500 Big Horn/Lone Star, 4D Quad Cab, HEMI 5.7L V8 Multi Displacement VVT, 8-Speed Automatic, 4WD, Bright White Clearcoat, Black Cloth, 1-Year SiriusXM Radio Service, 8.4 Touchscreen Display, ABS brakes, Add Class IV Receiver Hitch, Apple CarPlay, Auto-Dimming Exterior Driver Mirror, Auto-Dimming Rear-View Mirror, Big Horn IP Badge, Big Horn Level 1 Equipment Group, Class IV Receiver Hitch, Cluster 3.5 TFT Color Display, Compass, Electronic Stability Control, Exterior Mirrors Courtesy Lamps, Exterior Mirrors w/Supplemental Signals, Foam Bottle Insert (Door Trim Panel), For More Info, Call 800-643-2112, Glove Box Lamp, Google Android Auto, Heated door mirrors, Illuminated entry, Integrated Center Stack Radio, Low tire pressure warning, Power 4-Way Driver Lumbar Adjust, Power 8-Way Driver Seat, Power Adjustable Pedals, Power Black Trailer Tow Mirrors, Power Heated Fold Away Mirrors, Power-Folding Mirrors, Quick Order Package 25Z Big Horn/Lone Star, Radio: Uconnect 4 w/8.4 Display, Rear Dome w/On/Off Switch Lamp, Rear Power Sliding Window, Rear Window Defroster, Remote keyless entry, Single Disc Remote CD Player, SiriusXM Satellite Radio, Steering Wheel Mounted Audio Controls, Sun Visors w/Illuminated Vanity Mirrors, Traction control, Trailer Brake Control, Trailer Tow Group, Trailer Tow Mirrors, Universal Garage Door Opener, Wheels: 20 x 9 Aluminum Chrome Clad. 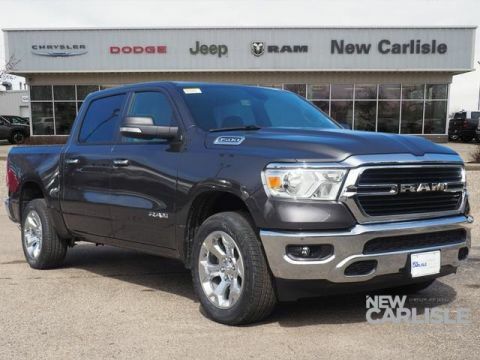 2019 Ram 1500 Big Horn/Lone Star 1500 Big Horn/Lone Star, 4D Crew Cab, 3.6L V6 24V VVT, 8-Speed Automatic, 4WD, Diamond Black, Black Cloth, 1-Year SiriusXM Radio Service, 8.4 Touchscreen Display, Apple CarPlay, Auto-Dimming Exterior Driver Mirror, Auto-Dimming Rear-View Mirror, Big Horn IP Badge, Big Horn Level 1 Equipment Group, Class IV Receiver Hitch, Cluster 3.5 TFT Color Display, Exterior Mirrors Courtesy Lamps, Exterior Mirrors w/Supplemental Signals, Foam Bottle Insert (Door Trim Panel), For More Info, Call 800-643-2112, Glove Box Lamp, Google Android Auto, Integrated Center Stack Radio, Power 4-Way Driver Lumbar Adjust, Power 8-Way Driver Seat, Power Adjustable Pedals, Power Heated Fold Away Mirrors, Power-Folding Mirrors, Quick Order Package 23Z Big Horn/Lone Star, Radio: Uconnect 4 w/8.4 Display, Rear Dome w/On/Off Switch Lamp, Rear Power Sliding Window, Rear Window Defroster, Single Disc Remote CD Player, SiriusXM Satellite Radio, Steering Wheel Mounted Audio Controls, Sun Visors w/Illuminated Vanity Mirrors, Universal Garage Door Opener. 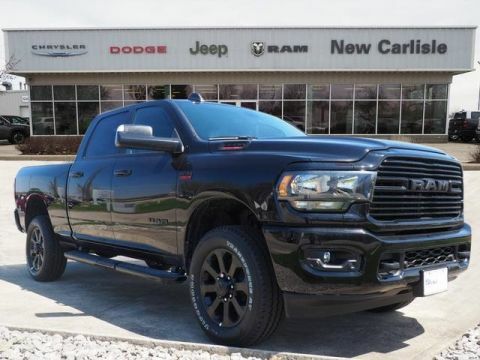 2019 Ram 1500 Big Horn/Lone Star 1500 Big Horn/Lone Star, 4D Crew Cab, 8-Speed Automatic, 4WD, Diamond Black, Black Cloth, 1-Year SiriusXM Radio Service, 8.4 Touchscreen Display, Apple CarPlay, Auto-Dimming Exterior Driver Mirror, Auto-Dimming Rear-View Mirror, Big Horn IP Badge, Big Horn Level 1 Equipment Group, Class IV Receiver Hitch, Cluster 3.5 TFT Color Display, Exterior Mirrors Courtesy Lamps, Exterior Mirrors w/Supplemental Signals, Foam Bottle Insert (Door Trim Panel), For More Info, Call 800-643-2112, Glove Box Lamp, Google Android Auto, Integrated Center Stack Radio, Power 4-Way Driver Lumbar Adjust, Power 8-Way Driver Seat, Power Adjustable Pedals, Power Heated Fold Away Mirrors, Power-Folding Mirrors, Quick Order Package 25Z Big Horn/Lone Star, Radio: Uconnect 4 w/8.4 Display, Rear Dome w/On/Off Switch Lamp, Rear Power Sliding Window, Rear Window Defroster, Single Disc Remote CD Player, SiriusXM Satellite Radio, Steering Wheel Mounted Audio Controls, Sun Visors w/Illuminated Vanity Mirrors, Trailer Brake Control, Universal Garage Door Opener, Wheels: 20 x 9 Aluminum Chrome Clad. 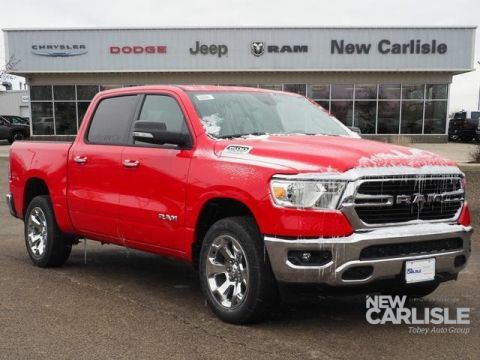 2019 Ram 1500 Big Horn/Lone Star 1500 Big Horn/Lone Star, 4D Crew Cab, HEMI 5.7L V8 Multi Displacement VVT, 8-Speed Automatic, 4WD, Flame Red Clearcoat, ABS brakes, Alloy wheels, Compass, Driver door bin, Electronic Stability Control, Heated door mirrors, Illuminated entry, Low tire pressure warning, Quick Order Package 25Z Big Horn/Lone Star, Remote keyless entry, Steering Wheel Mounted Audio Controls, Traction control. 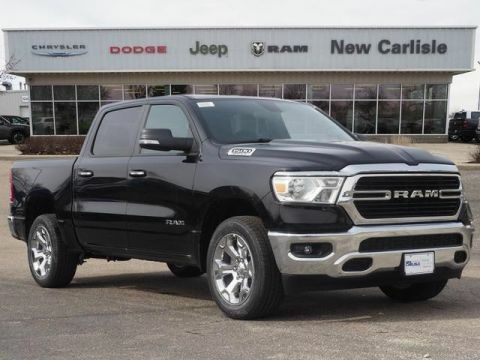 2019 Ram 1500 Big Horn Remote Start, 1500 Big Horn, 4D Crew Cab, HEMI 5.7L V8 Multi Displacement VVT, 8-Speed Automatic, 4WD, Granite Crystal Metallic Clearcoat, Black Cloth, 1-Year SiriusXM Radio Service, 4x4 Decal, 8.4 Touchscreen Display, ABS brakes, Apple CarPlay, Auto-Dimming Exterior Driver Mirror, Auto-Dimming Rear-View Mirror, Big Horn IP Badge, Big Horn Level 1 Equipment Group, Class IV Receiver Hitch, Cluster 3.5 TFT Color Display, Compass, Deployable Bed Step, Electronic Stability Control, E-Locker Rear Axle, Exterior Mirrors Courtesy Lamps, Exterior Mirrors w/Supplemental Signals, Foam Bottle Insert (Door Trim Panel), For More Info, Call 800-643-2112, Front Extra HD Shock Absorbers, Glove Box Lamp, Google Android Auto, Heated door mirrors, Hill Descent Control, Illuminated entry, Integrated Center Stack Radio, Low tire pressure warning, Off Road Decals, Off Road Group, Power 4-Way Driver Lumbar Adjust, Power 8-Way Driver Seat, Power Adjustable Pedals, Power Heated Fold Away Mirrors, Power-Folding Mirrors, Quick Order Package 25Z Big Horn/Lone Star, Radio: Uconnect 4 w/8.4 Display, Rear Dome w/On/Off Switch Lamp, Rear Extra HD Shock Absorbers, Rear Power Sliding Window, Rear Window Defroster, Remote keyless entry, Single Disc Remote CD Player, SiriusXM Satellite Radio, Steering Wheel Mounted Audio Controls, Sun Visors w/Illuminated Vanity Mirrors, Tow Hooks, Traction control, Trailer Brake Control, Universal Garage Door Opener. 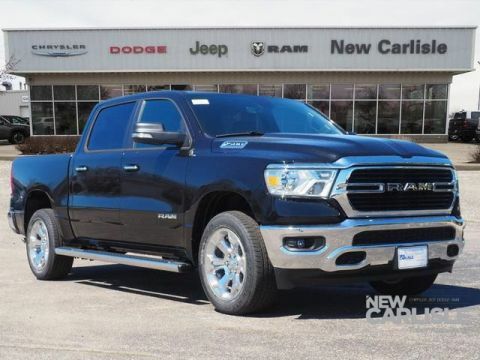 2019 Ram 1500 Big Horn/Lone Star 1500 Big Horn/Lone Star, 4D Crew Cab, HEMI 5.7L V8 Multi Displacement VVT, 8-Speed Automatic, 4WD, Diamond Black, Black Cloth, 115V Auxiliary Power Outlet, 115V Auxiliary Rear Power Outlet, 1-Year SiriusXM Radio Service, 2 USB Full Function/Charge Only Media Hub, 400W Inverter, 8.4 Touchscreen Display, ABS brakes, Air Conditioning ATC w/Dual Zone Control, Apple CarPlay, Auto-Dimming Exterior Driver Mirror, Auto-Dimming Rear-View Mirror, Big Horn IP Badge, Big Horn Level 2 Equipment Group, Class IV Receiver Hitch, Cluster 7.0 TFT Color Display, Compass, Dampened Tailgate, Electronic Stability Control, Exterior Mirrors Courtesy Lamps, Exterior Mirrors w/Supplemental Signals, Foam Bottle Insert (Door Trim Panel), For More Info, Call 800-643-2112, Glove Box Lamp, Google Android Auto, Heated door mirrors, Heated Front Seats, Heated Steering Wheel, Illuminated entry, Integrated Center Stack Radio, Low tire pressure warning, ParkSense Front/Rear Park Assist w/Stop, Power 4-Way Driver Lumbar Adjust, Power 8-Way Driver Seat, Power Adjustable Pedals, Power Heated Fold Away Mirrors, Power-Folding Mirrors, Quick Order Package 25Z Big Horn/Lone Star, Radio: Uconnect 4 w/8.4 Display, Rear Dome w/On/Off Switch Lamp, Rear Power Sliding Window, Rear Window Defroster, Remote keyless entry, Remote Start System, Security Alarm, Single Disc Remote CD Player, SiriusXM Satellite Radio, Steering Wheel Mounted Audio Controls, Sun Visors w/Illuminated Vanity Mirrors, Traction control, Trailer Brake Control, Universal Garage Door Opener, Wheels: 20 x 9 Aluminum Chrome Clad (WRD). 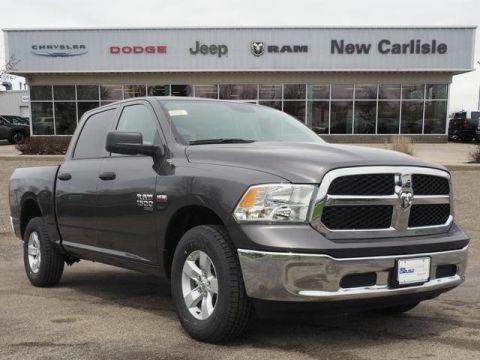 2019 Ram 1500 Big Horn/Lone Star 1500 Big Horn/Lone Star, 4D Crew Cab, 115V Auxiliary Power Outlet, 115V Auxiliary Rear Power Outlet, 1-Year SiriusXM Radio Service, 2 USB Full Function/Charge Only Media Hub, 3 Rear Seat Head Restraints, 4 Way Front Headrests, 400W Inverter, 8.4 Touchscreen Display, Air Conditioning ATC w/Dual Zone Control, Apple CarPlay, Auto-Dimming Exterior Driver Mirror, Auto-Dimming Rear-View Mirror, Big Horn IP Badge, Big Horn Level 2 Equipment Group, Black Interior Accents, Body Color Door Handles, Body Color Front Bumper, Body Color Rear Bumper w/Step Pads, Bucket Seats, Center Console Parts Module, Class IV Receiver Hitch, Cluster 7.0 TFT Color Display, Dampened Tailgate, Deluxe Cloth Bucket Seats, Exterior Mirrors Courtesy Lamps, Exterior Mirrors w/Memory, Exterior Mirrors w/Supplemental Signals, Foam Bottle Insert (Door Trim Panel), For More Info, Call 800-643-2112, Front Seat Back Map Pockets, Full Length Floor Console, Glove Box Lamp, Google Android Auto, Grille B/Color Outline 1 Texture 2, Heated Front Seats, Heated Steering Wheel, Integrated Center Stack Radio, Manual Adjust 4-Way Front Passenger Seat, ParkSense Front/Rear Park Assist w/Stop, Power 4-Way Driver Lumbar Adjust, Power 8-Way Driver Seat, Power Adjustable Pedals, Power Heated Fold Away Mirrors, Power Heated Fold-Away Mirrors, Power-Folding Mirrors, Quick Order Package 27Z Big Horn/Lone Star, Radio: Uconnect 4 w/8.4 Display, Rear 60/40 Folding Seat, Rear Dome w/On/Off Switch Lamp, Rear Power Sliding Window, Rear Window Defroster, Remote Start System, Security Alarm, Single Disc Remote CD Player, SiriusXM Satellite Radio, Sport Appearance Package, Steering Wheel Mounted Audio Controls, Sun Visors w/Illuminated Vanity Mirrors, Universal Garage Door Opener. 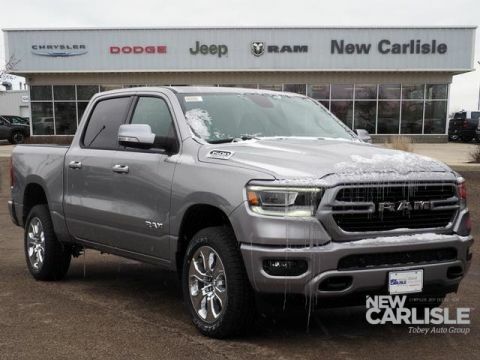 2019 Ram 1500 Tradesman 4D Crew Cab, HEMI 5.7L V8 Multi Displacement VVT eTorque, 8-Speed Automatic, 4WD, Billet Silver Metallic, 1-Year SiriusXM Radio Service, 3 Rear Seat Head Restraints, 4 Way Front Headrests, 40/20/40 Split Bench Seat, ABS brakes, Bright Front Bumper, Bright Rear Bumper, Carpet Floor Covering, Chrome Appearance Group, Cloth 40/20/40 Bench Seat, Compass, Electronic Stability Control, E-Locker Rear Axle, For More Info, Call 800-643-2112, Front & Rear Floor Mats, Front Extra HD Shock Absorbers, Grille Chrome Outline 1 Texture 1, Heated door mirrors, Hill Descent Control, Illuminated entry, Low tire pressure warning, Off Road Decals, Off Road Group, Quick Order Package 27A Tradesman, Rear Extra HD Shock Absorbers, Rear Folding Seat, Rear Power Sliding Window, Remote keyless entry, SiriusXM Satellite Radio, Tow Hooks, Traction control, Tradesman Level 1 Equipment Group, Wheels: 18 x 8 Premium Paint Cast. 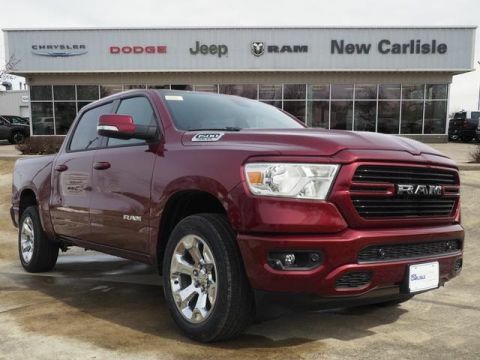 Price includes $1,500 dealer added accessories. 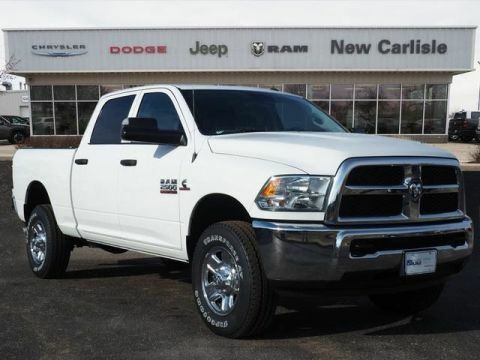 2018 Ram 2500 Tradesman 2500 Tradesman, 4D Crew Cab, Cummins 6.7L I6 Turbodiesel, 6-Speed Automatic, 4WD, Bright White Clearcoat, Black Cloth, 1-Yr SiriusXM Radio Service, Bright Front Bumper, Bright Grille, Bright Rear Bumper, Carpet Floor Covering, Chrome Appearance Group, For More Info, Call 800-643-2112, Front & Rear Floor Mats, Popular Equipment Group, Quick Order Package 2FA Tradesman, Remote Keyless Entry, SiriusXM Satellite Radio, Trailer Brake Control, Wheels: 18 x 8.0 Steel Chrome Clad. 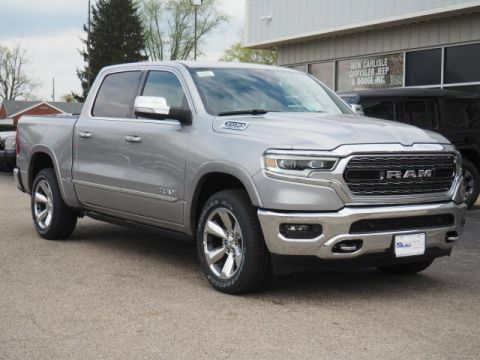 2019 Ram 1500 Big Horn/Lone Star 1500 Big Horn/Lone Star North Edition, 4D Crew Cab, HEMI 5.7L V8 Multi Displacement VVT, 8-Speed Automatic, 4WD, Billet Silver Metallic, Black Cloth, 115V Auxiliary Power Outlet, 115V Auxiliary Rear Power Outlet, 1-Year SiriusXM Radio Service, 2 USB Full Function/Charge Only Media Hub, 400W Inverter, 4x4 Decal, 8.4 Touchscreen Display, 9 Amplified Speakers w/Subwoofer, ABS brakes, Air Conditioning ATC w/Dual Zone Control, Apple CarPlay, Auto-Dimming Exterior Driver Mirror, Auto-Dimming Rear-View Mirror, Big Horn IP Badge, Big Horn Level 2 Equipment Group, Body Color Door Handles, Body Color Front Bumper, Body Color Rear Bumper w/Step Pads, Class IV Receiver Hitch, Cluster 7.0 TFT Color Display, Compass, Dampened Tailgate, Electronic Stability Control, E-Locker Rear Axle, Engine Block Heater, Exterior Mirrors Courtesy Lamps, Exterior Mirrors w/Memory, Exterior Mirrors w/Supplemental Signals, Foam Bottle Insert (Door Trim Panel), For More Info, Call 800-643-2112, Front & Rear Rubber Floor Mats, Front Extra HD Shock Absorbers, Front LED Fog Lamps, Glove Box Lamp, Google Android Auto, Grille B/Color Outline 1 Texture 2, Heated door mirrors, Heated Front Seats, Heated Steering Wheel, Hill Descent Control, Illuminated entry, Integrated Center Stack Radio, LED Reflector Headlamps, LED Taillamps, Low tire pressure warning, North Edition, ParkSense Front/Rear Park Assist w/Stop, Power 4-Way Driver Lumbar Adjust, Power 8-Way Driver Seat, Power Adjustable Pedals, Power Heated Fold Away Mirrors, Power Heated Fold-Away Mirrors, Power-Folding Mirrors, Premium Lighting Group, Quick Order Package 25Z Big Horn/Lone Star, Radio: Uconnect 4 w/8.4 Display, Rear Dome w/On/Off Switch Lamp, Rear Extra HD Shock Absorbers, Rear Power Sliding Window, Rear Window Defroster, Remote keyless entry, Remote Start System, Security Alarm, Single Disc Remote CD Player, SiriusXM Satellite Radio, Steering Wheel Mounted Audio Controls, Sun Visors w/Illuminated Vanity Mirrors, Tow Hooks, Traction control, Trailer Brake Control, Universal Garage Door Opener, Wheels: 20 x 9 Aluminum Chrome Clad (WRD). 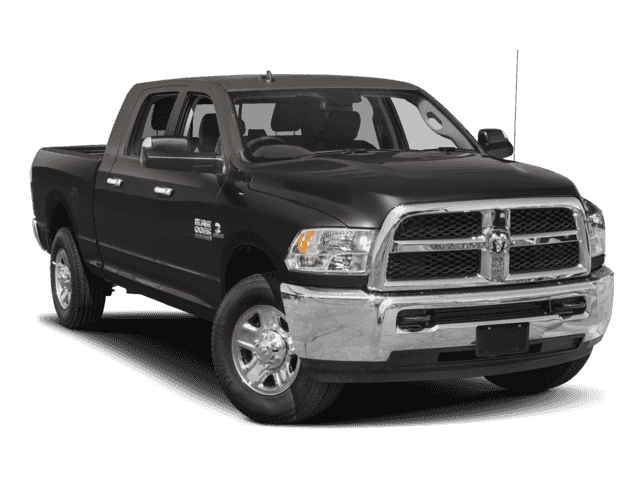 2019 Ram 2500 Big Horn 2500 Big Horn, 4D Crew Cab, 6.4L Heavy Duty V8 HEMI w/MDS, 8-Speed Automatic, 4WD, Diamond Black, Black Cloth, 1-Yr SiriusXM Radio Service, 2 Way Rear Headrest Seat, 2nd Row In Floor Storage Bins, 4 Way Front Headrests, 40/20/40 Split Bench Seat, 8.4 Touchscreen Display, 9 Alpine Speakers w/Subwoofer, Apple CarPlay, Auto-Dimming Rear-View Mirror, Big Horn Level 1 Equipment Group, Black Appearance Package, Black Exterior Truck Badging, Black Headlamp Bezels, Black Interior Accents, Black Ram Head Tailgate Badge, Body Color Door Handles, Body Color Grille Surround, Center Stack Storage Drawer, Dark Taillamp Bezels, Dual Glove Boxes, Foam Bottle Insert (Door Trim Panel), Folding Flat Load Floor Storage, Footwell Courtesy Lamp, For More Info, Call 800-643-2112, Front Armrest w/Cupholders, Front Center Seat Cushion Storage, Front Fog Lamps, Front Seat Back Map Pockets, Gloss Black Grille Billets/Accents, Glove Box Lamp, Google Android Auto, Heated Front Seats, Heated Seats & Wheel Group, Heated Steering Wheel, Integrated Center Stack Radio, Leather Wrapped Steering Wheel, Locking Lower Glove Box, Manual Adjust 4-Way Front Passenger Seat, Painted Front Bumper, Painted Rear Bumper, Power 2-Way Driver Lumbar Adjust, Power Adjust 8-Way Driver Seat, Power Adjust/Fold & Heated Black Tow Mirrors, Power Adjustable Pedals, Power Folding Mirrors, Premium Cloth 40/20/40 Bench Seat, Protection Group, Quick Order Package 2ZZ Big Horn, Radio: Uconnect 4 w/8.4 Display, Rear 60/40 Folding Seat, Rear Dome w/On/Off Switch Lamp, SiriusXM Satellite Radio, Steering Wheel Mounted Audio Controls, Sun Visors w/Illuminated Vanity Mirrors, Tow Hooks, Universal Garage Door Opener, Wheels: 20 x 8.0 Black Painted Aluminum. 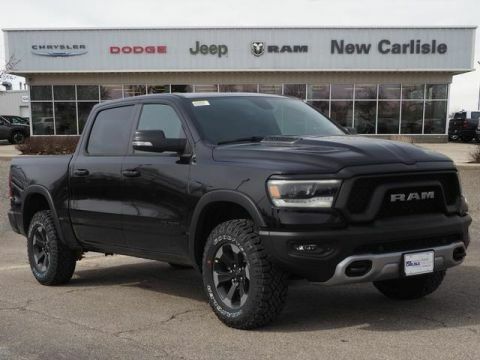 2019 Ram 1500 Rebel 1500 Rebel, 4D Crew Cab, HEMI 5.7L V8 Multi Displacement VVT, 8-Speed Automatic, 4WD, Diamond Black, Black Cloth, 115V Auxiliary Rear Power Outlet, 12 Touchscreen Display, 1-Year SiriusXM Radio Service, 1-YR SiriusXM Guardian Trial, 2 USB Full Function/Charge Only Media Hub, 5-Year SiriusXM Traffic Service, 5-Year SiriusXM Travel Link Service, 8.4 Touchscreen Display, ABS brakes, Air Conditioning ATC w/Dual Zone Control, Alloy wheels, Apple CarPlay, Auto-Dimming Exterior Driver Mirror, Auto-Dimming Rear-View Mirror, Body Color Door Handles, Compass, Disassociated Touchscreen Display, Dome Dual LED Reading Lamp, Dual-Pane Panoramic Sunroof, Electronic Stability Control, Exterior Mirrors Courtesy Lamps, Exterior Mirrors w/Supplemental Signals, Foam Bottle Insert (Door Trim Panel), For Details, Visit DriveUconnect.com, For More Info, Call 800-643-2112, Google Android Auto, GPS Antenna Input, GPS Navigation, HD Radio, Heated door mirrors, Heated Front Seats, Heated Steering Wheel, Illuminated entry, Integrated Center Stack Radio, Low tire pressure warning, No Satellite Coverage w/HI/AK/PR/VI/GU, Overhead LED Lamps, ParkSense Front/Rear Park Assist w/Stop, Power Adjustable Pedals, Power Heated Fold Away Mirrors, Power-Folding Mirrors, Premium Overhead Console, Quick Order Package 25W Rebel, Radio: Uconnect 12 w/Navigation, Rain Sensitive Windshield Wipers, Rear Dome w/On/Off Switch Lamp, Rear Underseat Compartment Storage, Rear Window Defroster, Rebel Level 2 Equipment Group, Remote keyless entry, Remote Proximity Keyless Entry, Remote Start System, Security Alarm, Single Disc Remote CD Player, SiriusXM Satellite Radio, SiriusXM Traffic Plus, SiriusXM Travel Link, SiriusXM w/360L, Sun Visors w/Illuminated Vanity Mirrors, Traction control, Trailer Brake Control, Universal Garage Door Opener, USB Host Flip. 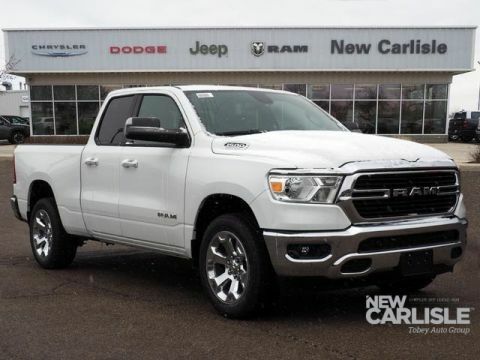 2019 Ram 1500 Laramie 1500 Laramie, 4D Crew Cab, HEMI 5.7L V8 Multi Displacement VVT, 8-Speed Automatic, 4WD, Ivory, Black Leather, 10 Speakers, Door Trim Panel Foam Bottle Insert, Front Heated Seats, Front Ventilated Seats, Laramie Level 1 Equipment Group, Park-Sense Front & Rear Park Assist, Power 8-Way Adjustable Front Seats, Power passenger seat, Quick Order Package 25H Laramie, Rain-Sensing Windshield Wipers, Rear 60/40 Folding & Reclining Seat, Remote Tailgate Release, Single-Disc Remote CD Player, Tailgate Ajar Warning Lamp, Ventilated front seats. 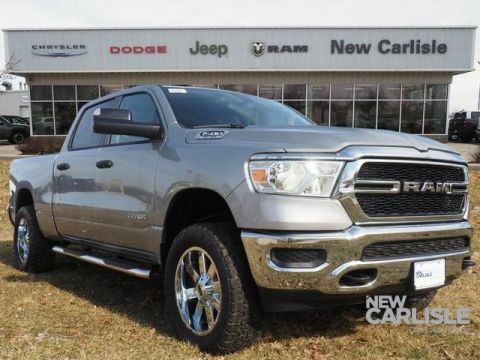 Price includes $2,200 dealer added accessories. 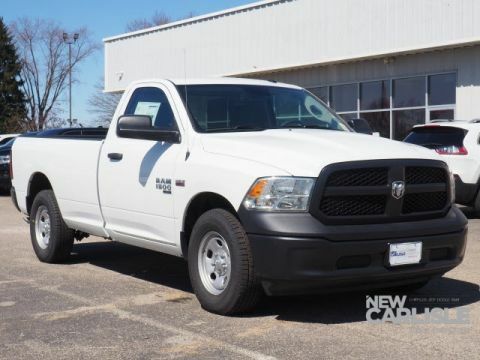 2018 Ram 2500 Big Horn ABS brakes, Compass, Electronic Stability Control, Heated door mirrors, Illuminated entry, Low tire pressure warning, Remote keyless entry, Traction control. 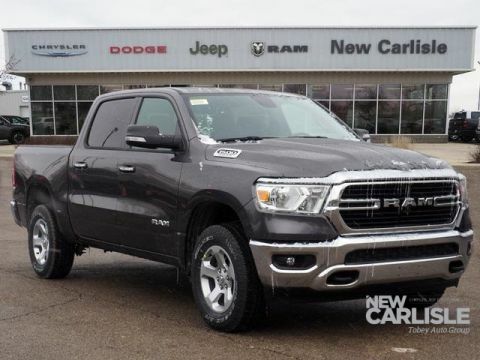 2019 Ram 1500 Limited 1500 Limited, 4D Crew Cab, HEMI 5.7L V8 Multi Displacement VVT, 8-Speed Automatic, 4WD, Billet Silver Metallic, Black Leather, 10 Speakers, 12 Touchscreen Display, 1-YR SiriusXM Guardian Trial, Adaptive Cruise Control w/Stop & Go, Advanced Brake Assist, Apple CarPlay, Automatic temperature control, Disassociated Touchscreen Display, Dome Dual LED Reading Lamp, Dual-Pane Panoramic Sunroof, Front dual zone A/C, Full Speed Forward Collision Warning Plus, Google Android Auto, GPS Antenna Input, GPS Navigation, harman/kardon 19 Speaker Premium Sound, HD Radio, Integrated Center Stack Radio, Lane Keep Assist, LED Dome/Reading Lamp, Limited Level 1 Equipment Group, No Satellite Coverage w/HI/AK/PR/VI/GU, Parallel & Perp Park Assist w/Stop, Quick Order Package 25M Limited, Radio: Uconnect 12 w/Navigation, SiriusXM Satellite Radio, SiriusXM Traffic Plus, SiriusXM Travel Link, SiriusXM w/360L, Trailer Brake Control, USB Host Flip, Ventilated Rear Seats, Wheels: 20 x 9 Polished w/Inserts.